This season made me remember how easily not only a series can change throughout its course but also one’s opinion concerning the anime. If my rating for DanMachi were to be represented graphically, it’d look like the letter “M,” whereas my rating for Hibike! 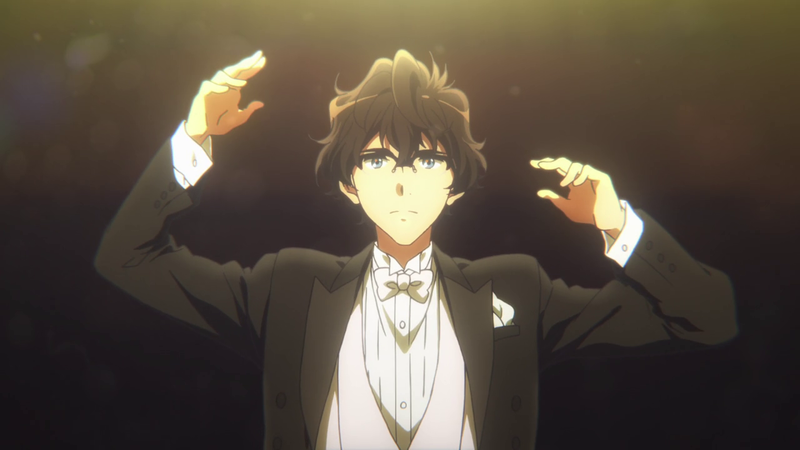 Euphonium would almost begrudgingly look like a “U.” I think I was purposefully being down on the series just because of a few hiccups that it had, when in actuality things came together at the end, and I was able to appreciate how far the series and its characters came. Once I dragged myself from the negative quagmire that surrounded those couple of episodes, I can come out of the series and say that I thoroughly enjoyed it, largely thanks to many of the reasons I cited at the beginning. Hibike! 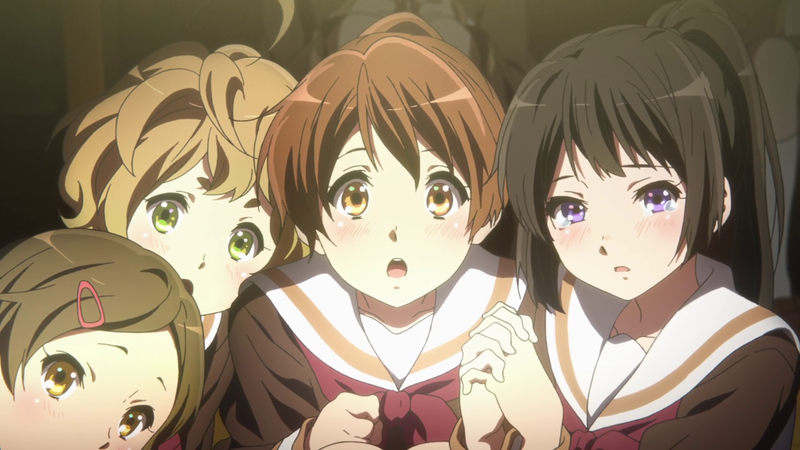 Euphonium captures the essence of what it’s like to be a teenager and to be in a band. I think I’m at a good age where I’m far enough removed from high school to look upon these experiences objectively, while retaining just a tinge of nostalgia and plenty of empathy. As we’ve seen, an organization like band brings with it a ton of drama, emotion, and anxiety, perhaps even more than we usually get with other high school set shows. This last episode brings the anxiety and nerves to their highest, to the point where even I’m feeling nervous for these characters, and I think it’s impressive when any show can do that to me. As the band is waiting backstage, filing onto the stage, mid-performance, and especially when they’re waiting for the results, there is a tension hanging in the air that feels remarkably real. Maybe it’s because I know what that pressure feels like, maybe it’s because of KyoAni’s great animation, but regardless the reason, everything about this episode just works. I know it’s been a while, but the scene where the band is awaiting the results is a direct, purposeful parallel to the very first scene of the first episode. Except now, there’s a bunch that’s different, and thing that’s changed the most is Kumiko. She no longer wants to settle for loser gold, possessing the same strong desire that Reina held all of those episodes – that same desire that, at first, Kumiko couldn’t understand. Now, everyone’s holding hands and wishing for the exact same thing, and this invincible excitement is communicated excellently to us. No need for an inner-head monologue about what it would mean to win. We can see everything we need to know on their faces. So where now? The band has advanced to the next round, but the series over, so does that mean a second season? My guess is that Hibike! 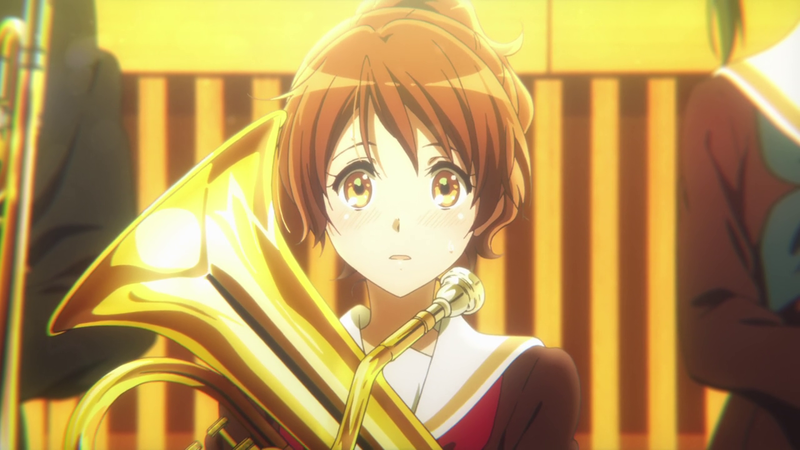 Euphonium will continue the trend of KyoAni movie sequels, following the likes of Tamako Market and Kyoukai no Kanata. My hope is that if there is a movie, that it avoids centering the plot around a romance like Tamako Market did. Unless, of course, that romance is between Kumiko and Reina. Regardless of what the light novels may say, the anime effectively ended its narrative with a close-up shot of Kumiko and Reina holding hands. Today, love a strong bond won.